“Around the Corner: Stories of Struggle and Hope” (published by Balboa Press) details The Soul Twins’ (Julie Stine and Debbie Yuzwa) life’s journey, personal struggles with anxiety, depression and suicide and their path to spirituality to support people experiencing hardship in their life. Filled with stories of assurance, encouragement and enlightenment, the authors seek to help others who find themselves feeling alone. “Around the Corner” aims to shed light on those in a dark space who feel lost, empty and or overwhelmed. By illuminating their path, The Soul Twins trust that readers can see their first step to the life that they were destined to live. “There are so many struggling with being disconnected. They are consumed by darkness. They need to feel loved and need to know that there are people who will embrace them. They need hope and to feel connected to one another,” the authors say, adding that they want their book to help readers feel that they are powerful and loved and that they matter. 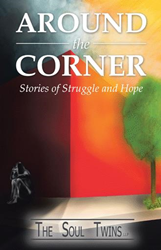 The book is available for purchase at: https://www.amazon.com/Around-Corner-Stories-Struggle-Hope/dp/1982218703. The Soul Twins, Julie Stine and Debbie Yuzwa, have been asked if they are sisters and lovingly referred to as “The Twins.” They have been through many challenging circumstances — including some dark places. By sharing these experiences, they encourage readers to find a path of enlightenment — one they have found themselves. The Soul Twins wish to help readers find their place in this world.